In the same period last year (June 2017), Jefferson Sabiano Ventura from Saint Louis University (SLU) garnered the highest place, obtaining 84.70% average grade to top the 1,490 out of 2,679 examinees. It was followed by Aldous Yabut Olbes from Pamantasan ng Lungsod ng Maynila (PLM), 84.30%. In the June 2016 exams, Jeff McDaniel Yu See, graduate of University of Santo Tomas (UST) topped the board with 84.00%. 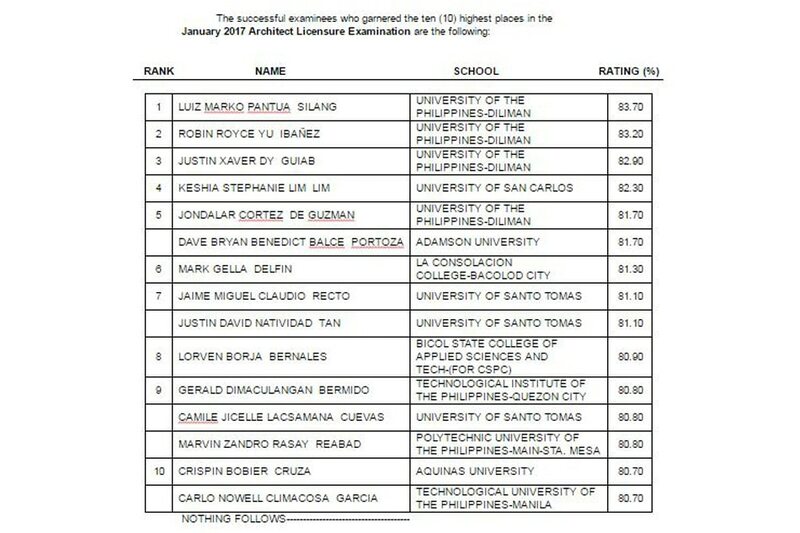 Technological University of the Philippines (TUP)-Manila alumni Arjee Louie Dela Cruz Jimenez ranked second with 83.10%. A total of 1,243 out of 2,224 examinees successfully hurdled the licensure exam. In few days after the release of results, the Verification of Rating (VoR) page of PRC for June 2018 ALE will be available online. Enter the required information – exam name, exam date, application number, name and birthdate to verify identity. According to PRC Resolution No. 2017-1068, which deals with the ‘Schedule of Licensure Examinations for Year 2018’, the target release date of Architect board exam result is on Thursday, July 5, or in four (4) working days after the tests. The Viva Filipinas will update this page immediately once the results are officially released online. Monitor announcement of results here or visit the official website of PRC (prc.gov.ph) for more information. The Professional Regulation Commission announced Wednesday that 3,935 out of 9,482 passed the Civil Engineer Licensure Examination given by the Board of Civil Engineering in Manila, Baguio, Cagayan de Oro, Cebu, Davao, Iloilo, Legazpi, Lucena and Tacloban this November 2015. The results were released in 2 working days after the last day of examination. Registration for the issuance of Professional Identification Card (ID) and Certificate of Registration will be start on December 1, 2015 but not later than December 4, 2015. Those who will register are required to bring the following: duly accomplished Oath Form or Panunumpa ng Propesyonal, current Community Tax Certificate (cedula), 1 piece passport size picture (colored with white background and complete name tag), 2 sets of metered documentary stamps and 1 short brown envelope with name and profession and to pay the Initial Registration Fee of P600 and Annual Registration Fee of P450 for 2015-2018. Successful examinees should personally register and sign in the Roster of Registered Professionals. MANILA – The Professional Regulation Commission (PRC) announced Friday that 1,784 out of 4,467 passed the Electronics Engineer Licensure Examination and 2,984 out of 3,518 passed the Electronics Technician Licensure Examination given by the Board of Electronics Engineering in the cities of Manila, Baguio, Cebu, Davao and Lucena in October 2015. The results were released in three working days after the last day of examinations. Registration for the issuance of Professional Identification Card (ID) and Certificate of Registration will be from November 6 to 11, 2015. Those who will register are required to bring the following: duly accomplished Oath Form or Panunumpa ng Propesyonal, current Community Tax Certificate (cedula), one piece passport-size picture (colored with white background and complete name tag), two sets of metered documentary stamps and one short brown envelope with name and profession and to pay the Initial Registration Fee of P600 and Annual Registration Fee of P450 for 2015-2018.